Leading off today: Assuming they commit a slash later this week, would members of the NYSPHSAA Executive Committee be sent to the penalty box for 90 seconds or would it be two full minutes? The 22-member committee gathers Friday in Saratoga Springs for its quarterly meeting, and one of the important items on the agenda is a scheduled vote to rescind a major rules change in ice hockey. If they do so, games in the New York State Public High School Athletic Association tournament in early March will revert to 15-minute periods with minor infractions returning to just 90 seconds served in the penalty box. It would be a significant, disruptive change for the 16 total teams reaching the state quarterfinals in two divisions after playing a regular season with 17-minute periods and two-minute minor penalties (and 4:00 and 7:30 majors that would also be adjusted). The move to longer periods and penalties went into effect in November, causing many if not most coaches to change philosophies and strategies. Inconsequential on the surface to casual observers, the extra 30 seconds in the penalty box has made it more difficult for teams to kill off shorthanded situations by means of using the same four skaters for most if not all of the shift. Coaches have had to dig deeper into their bench for penalty-killers and have put increased emphasis on avoiding penalties. So what's happening -- and why -- this week? In July 2017, the NYSPHSAA Central Committee approved increasing the length of games to three 17-minute periods beginning this season. The organization representing ice hockey officials filed a grievance last year seeking 13 percent more money for working state tournament games as a result of the increased time on the ice. A fact-finding committee sided with the officials and recommended increasing the fee by 13 percent, which caused the NYSPHSAA's Championship Advisory Committee (CAC) to recommend returning to 15-minute periods. The state hockey committee consisting of representatives from each section opposes the CAC's recommendation. The CAC's recommendation wasn't made as a matter of dollars and cents since only 14 playoff games over the final two weekends would be subject to the higher officials fees and the arbitration process probably cost the parties at least as much as what the increased pay would amount to this year for all officials combined. Rather, it's a matter of governance. The CAC is the body that makes recommendations for state championship fees every three years, setting the stipends as an average of what the respective sections pay officials to work their own championships leading up to state tournaments. The recent 9-2 vote by the CAC to recommend reverting to 15-minute periods in effect says it's not good policy to amend rates in the middle of the three-year cycle. "The concern from some is that if we give the hockey officials the raise, we would be setting our process aside," NYSPHSAA Executive Director Robert Zayas told me this weekend. And while that may seem petty or bureaucratic, there is a case to be made for not setting a precedent. Going against policy on one matter has a funny way of getting a group dragged back into arbitration (or the courtroom) on another policy. There may be room for reconsideration before the matter comes up for a vote Friday because there in fact does seem to be precedent for making changes midstream. Zayas has been digging through NYSPHSAA policies and past decisions in anticipation of questions likely to come from the floor on Friday and will advise the Executive Committee that the existing policy governing officials fees doesn't preclude recalculating in the middle of the three-year period in recognition of a significant rules change in a sport. Zayas' idea would increase the hockey officials fee from $103 to $111.76 per game this season and potentially make another tweak for the 2020 tournament in recognition that some sections are in the midst of negotiations with their officials to address the increased time on the ice. 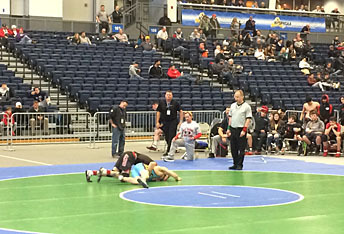 An unhappy surprise: I wasn't able to attend the inaugural NYSPHSAA wrestling dual-meet championships a year ago, so I was eager to make the trip to this year's event at SRC Arena on the Onondaga Community College campus. The quality of the competition did not surprise me at all. There were hiccups in the qualifying process earlier in the month -- weather reduced the field for the Section 3 tournament and forced cancellation of the Section 6 qualifier -- but there were 24 rock-solid teams competing Saturday. In addition, the set-up and organization were top-notch. 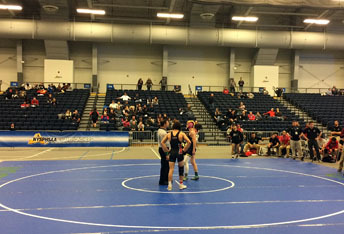 The NYSPHSAA, its wrestling committee and the SRC Arena staff did their jobs exceedingly well. The day had the look and feel of a major high school sporting event and Massapequa and Mount Sinai walked away as deserving champions. That being said, I was surprised and disappointed by the size of the crowd. For the second year in a row, attendance for the day checked in at around 1,100 spectators. The two photos above were taken during the side-by-side championship bouts Saturday evening involving one team apiece from Sections 3, 5, 8 and 11 and were not manipulated to create a bad impression; the vast areas of empty seats in the backgrounds qualified as prime seating for people who would have been interested in watching one or both finals. Obviously, one issue is that this meet wasn't a run-of-the-mill, regular-season event packed with local schools that would each bring a contingent of fans. Central Valley Academy and Fulton were the only Section 3 schools participating, and other relatively nearby schools such as Spencerport from Section 5 or the Section 4 reps did not reach the finals. That made a difference in attendance, just as it does when local teams do not make it to state finals in football, basketball or lacrosse. There's no "solving" that; weather and matchups are always going to have a disproportionate effect on attendance. Various schedules showed at least three Section 3 leagues holding their championship tournaments and at least one dual meet tournament in the area on Saturday. Such is the state of mass media these days that I couldn't find results for any of those meets (I know one was postponed to Monday) and therefore can't swear that they all took place. But whatever other meets were in the area were competing for eyeballs with the NYSPHSAA tournament, which is a drawback for a championship event that teams and fans were clamoring for all these years. Does that mean I'd like to see all other wrestling shut down for the day? No, definitely not. However, the winter season is the longest of the three in the school year, so one would think there might be wiggle room when it comes to scheduling. I know dual-meet tourneys are all the rage these days because coaches like to pack in extra matches for their kids, whose day doesn't end just because they suffered individual losses in the early rounds. And I know league tournaments are important for individual recognition. But isn't there some sort of compromise available one day a year in the section hosting the state dual-meet championships? Maybe it's the old guy in me, but whatever happened to two-team dual meets, triangulars and/or quadrangulars? All could be squeezed in on a Saturday morning in time for competitors and fans to make the trip to the state tournament and catch the most meaningful action later in the day.